Rogers Exhaust Shop in Fontana sells, installs, repairs, and replaces trailer hitches for all makes and models of cars, trucks, vans, SUVs, and RVs. With our expertly installed, high-quality trailer hitches, you can safely transport a wide range of light and heavy duty loads (up to 12,000 pounds). 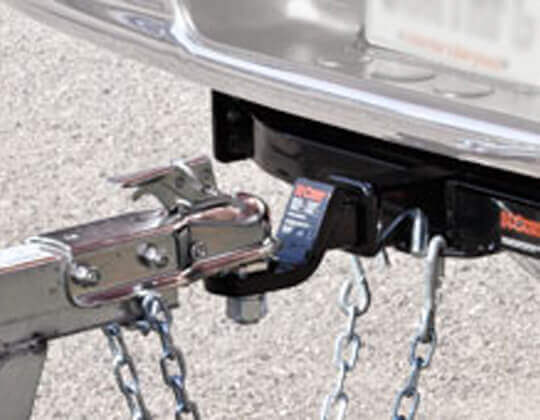 Whether you are looking to tow a boat, utility trailer, motorcycle, camper, or a few bikes, our experts will ensure that you get the right hitch for your needs. By providing superior service at an affordable price to thousands of satisfied customers, we've become known as the best value for trailer hitches in the Fontana, Rialto, Rancho Cucamonga, and Jurupa Valley area. At Rogers Exhaust, we carry a large stock of name-brand tow hitches, including CURT, TYGER, Reese, Hidden Hitch, and Draw-Tite. These brands offer a wide range of bolt-on and weld-in trailer hitches available in class I, II, III, and IV that can be custom fitted to your vehicle. Additionally, they are frequently backed by limited lifetime manufacturer warranties. We also sell and install OEM trailer hitches. All hitches are installed by our certified welders, who have extensive training and years of experience. They are qualified to handle most trailer installations, trailer hitch lighting hook up/electrical wiring, trailer hitch repairs, trailer hitch reinforcement, and trailer hitch modifications. We're so confident in the quality of our trailer hitch installation services that we back all of the labor involved with our own lifetime guarantee. Contact us today for an over-the-phone estimate, or stop by our shop for a free consultation. Rogers Exhaust Shop is open Monday through Friday from 8:00am - 6:00pm and available by appointment on Saturdays. We are licensed and insured, and a member of the Better Business Bureau. As a testament to the quality of our workmanship and honest business practices, we have received more than 75 five-star reviews on Yelp.